The CD-ROM model ran at 500 MHz, with a 66 MHz bus speed. The Combo drive model had a 20 GB hard drive. Announced in October 2001, the iBook (Late 2001) was a "speed-bump" of the iBook (Dual USB). The processor speed in most configurations was increased to 600 MHz, and the bus speed was increased to 100 MHz. The base RAM on the low-end model was increased to 128 MB, and the size of the internal hard drive was increased to 15 GB in most configurations. 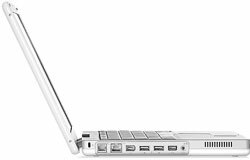 The iBook (Late 2001) was available in four configurations, each with a different optical drive: The CD-ROM model, running at 500 MHz, was $1299, The DVD-ROM model was $1499, the CD-RW model (available only as a BTO option at the Apple Store), $1599, and the "Combo" DVD-ROM/CD-RW Model, with a larger 20 GB hard drive, was $1699 (a $100 reduction from the previous Combo Drive model). 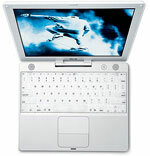 Following the addition of a 14.1" iBook in January 2002, the iBook (Dual USB) was repriced. The CD-ROM model moved to $1199, the CD-RW model was terminated, the DVD-ROM model (now available only as a BTO option) was now $1299, and the "Combo Drive" model was repriced to $1499.